Oldham Photographic Society (OPS) was formed in 1867 and was one of the earliest photographic societies in the World. Of those early-formed societies, many only lasted a few months or years before disbanding or amalgamating with other societies and clubs. There are now only a handful of the early societies, including Oldham, who have met continuously and who still exist today, perhaps only about ten. OPS has met continuously, without name change, through two world wars and its 150th anniversary will take place on 16th May 2017. 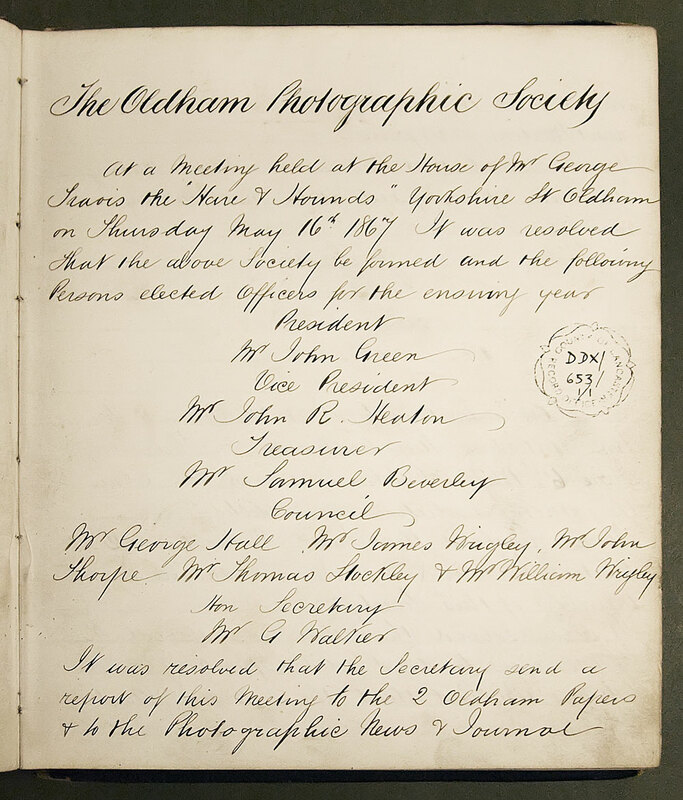 On Thursday, 16th May 1867, a group of photographers from Oldham and district met at the “house” of Mr George Travis, the Hare and Hounds, Yorkshire Street, Oldham. It was resolved that Oldham Photographic Society be formed. The image below is the first entry in the first Minute Book. Christine Widdall has written the history of the society in a book entitled “A Victorian Society” to commemorate the society’s 150th anniversary. Please see Christine’s website for details.